Guar gum split is the endosperm separated from its seeds. The endosperm of cluster bean seeds is refined to obtain refined splits. But before the splits are extracted there involves lots of procedures. The seeds of this cluster been plant are harvested and dried at the respective seasons. After drying, the beans are removed from the pods and they are then sent for removing germs and hull. The resulting product after drying is then sent for wet-milling where the seeds are grounded until they become fine particles or in powder form. The final product is then graded through quality granulation process which is then followed by re-blending in accordance with specifications. The packaging and labeling follows next. This product contains inherent properties for which it is preferred in several industries including textile, printing, cosmetic, pharmaceuticals, tanneries, mining, petroleum, explosives, pet food preparation and processing, and many more applications across global industries. This merchandise is either used in powder form or splits. We are one of the leading manufacturers who provide high grade guar gum endosperm and gum powder to different industries in many parts of the world. The splits of guar (cyamoperm tetragonoloba) contain non-ionic polysaccharide galactomanan for which it is preferred for several applications. The refining activity is done through mechanical process which helps to obtain 28-30% of pure split. The manufacturing depends on the prerequisite of end product. When it comes to sorting out splits of guar seeds it needs several steps to be followed. Basically, the sickle pods are hard to grind. Therefore, manufactures prefer roasting, differential attrition, filtration, sieving and then polishing as some of the significant methods in commercial production of splits. In addition, the endosperm is covered by fine layer of fibrous element which is referred to as the husk and pure splits can be obtained only after removing the husk from the endosperm. The final product received after removing the husk is called refined guar split. The refined splits are considered for preparation of guar gum powder. 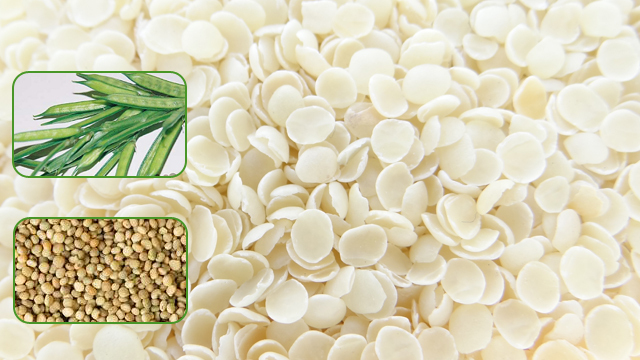 Apart from that, Guar split selection also stays very important in the manufacturing of higher grade guar gum as it helps to decide on the rate of hydration in the final form. Why Splits are hard to Process? The seeds of sickle pods are naturally hard to break. It can be done by soaking or roasting them so that; they become flexible for further processing. The splits on the other hand are also soaked to provide them high moisture content with the help of flaker machine. Splits obtained through flaker machine are then sent for grinding and drying. Since, the soaked condition also becomes difficult for processing, direct grinding is not recommended as it will reduce hydration quality of the product. Therefore, step by step method is followed in this regard. The manufacturing method as explained above starts with collection of good quality guar seeds. The seeds are processed and splitted to remove the germs from them. The splitting process is followed by dehusking in which the husks are totally removed leaving behind splits. Dissolution, Filtration of insoluble substances (if any presents) alcoholic precipitation, filtration, drying, and milling and finally send for packaging. The heat treatment is the prominent method that helps the hull to stay flexible for removal. However, after heat treatment attrition milling and impact mills are also applied to obtain pure form of splits. On the other hand, the endosperm of the seeds is separated through sieving. In addition, though sieving method the finer germs and fractions of hull are also removed and sent for transforming them into gum powder. Separation of splits stays very important method for processing endosperm gum powder of guar seeds. Depending on the industrial requirement and the type of end product guar splits are also processed in different methods to meet the commercial requisites. For example, the pre hydrated splits of guar endosperm are broken with the help of flacker machine or flacker mill and then sent to ultrafine grinding equipment where they are grounded without being exposed to heat. The grounded material is dried and then sent to screening for classification into grading.